July 21st is the date NASA shows what it can and can’t do. On this day in 1969, Neil Armstrong walked on the Moon, wiping out the humiliation of Sputnik in 1957 and Gagarin in 1961. This morning, just before dawn, the shuttle landed for the last time. The space race showed that by mobilising the intellectual, financial and industrial resources of the world’s most powerful nation, it was possible to achieve a spectacular if not particularly useful goal. After a few missions, manned flights to the Moon were abandoned. The shuttle was supposed to be a cheap, reliable space truck. It turned out to be expensive and dangerous and it too has now been abandoned. NASA claimed the programme would cost $7.45 billion ($43 billion in 2011 dollars, adjusting for inflation), and $9.3M ($54M in 2011 dollars) per flight. In fact, the programme cost $196 billion (adjusting for inflation) and costs nearly half a billion dollars per launch. And 14 of the 18 people killed flying into space died on the shuttle. One reason things didn’t work out as hoped is that the shuttle programme is a mix of innovation and technology lock-in or “path dependency” – you start doing a job one way and keep on doing it like that, even if another technology could do it better. In fact, Neal Stephenson of Future Tense argues that path dependency is a characteristic of space programmes since the start. Launch vehicles are based on the rockets used to lob nuclear weapons from one continent to another, and these in turn are based on the V2 rockets Germany developed at the end of WWII. By definition, these only had to work once, and accuracy wasn’t all that important, given the destructive power of the bombs they carried. Moreover, as long as they got the payload safely into space, it didn’t really matter how badly they themselves were damaged in the process. Clumsy, limited and expensive as they are, traditional rockets are still the best way we have to get payloads into space. But if space hadn’t been a race, maybe we would have taken the time to think about other ways of getting there. So has it all been a waste of money? The trillions of dollars spent on developing missiles and today’s spacecraft could have produced a very different space programme. But over 50 countries have now launched and operate a satellite, and at least 12 more intend to have their first satellite in orbit over the next five years. Space is an essential dimension of today’s world economic infrastructure, and a source of economic growth and new jobs. We’re all used to seeing satellite maps in weather forecasts, but many other applications are all around us without most people being aware of the spaceborne technologies they rely on. Mobile phone calls bounce off satellites, as do thousands of TV channels. Satellite tracking allows transport companies to locate ships across the world’s oceans, but also to tell us when the next bus is due. Automatic teller machines outside banks check your PIN code and other details via space. GPS navigation has created a whole new market for satnav equipment and software, with already more than a billion users in 2010. The use of mobile location technologies in automotive and consumer applications, including smart phones, has been growing exponentially since the early 2000s. Since its launch in May, the OECD’s Better Life Index has been attracting a lot of media coverage and, even better, lots of interest from users: In just its first month, the Index generated over a million hits. But, rather than the OECD trying to tell you what matters most, the Index lets you, the user, set the priorities. Or, as the blog noted in May, it lets “you compare and contrast the various factors that determine people’s well-being – not just GDP, but a much wider range of things like education, income, housing, security and so on”. The fact that this is a place where users set the priorities, not the OECD, has maybe got a little bit lost in some of the news coverage. That’s why you may have seen headlines like “OECD rates Australians as the happiest people in the world” or “Canadians can’t complain: Better Life Index”, or “USA comes up a bit short in global Better Life Index”. Although it’s still fairly new, the Better Life Index is already giving some clues about the issues users think are most important to a good life. We know that because the Better Life Index has a unique, interactive feature: It lets you, as a user, create your own Index and share it with the world. When you do so, your Index joins a database, and the results can then be put through the number cruncher. That’s just what they’ve been doing over at the OECD Factblog, where analysis of data so far shows users are currently ranking “Life Satisfaction” as the most important of the 11 topics on the Index. At the other end of the scale is “Governance”. It’s interesting to speculate on why that is: “Life satisfaction” echoes the name of the Index, so that may possibly be steering users to favour it. By contrast, “Governance” – although important as a policy issue – may be a more abstract term. What do an artisanal miner in the Democratic Republic of Congo, computer companies, and the Organisation for Economic Cooperation and Development in Paris have in common? They all have a keen interest in ensuring that mining in Africa does not fuel conflict. Last month, U.S. Secretary of State Hillary Clinton chaired a meeting celebrating the OECD’s 50th anniversary where ministers from OECD and developing economies agreed on a set of practical recommendations that will keep minerals from becoming “conflict minerals”. And recently in Washington, there were an important series of events around conflict minerals bringing together 200 downstream companies to discuss approaches and take action to ensure responsible sourcing. In fragile African states, illegal exploitation of natural resources has fueled conflict across the region for a decade. While data is scarce, it is estimated that up to 80% of minerals in some of the worst-affected areas may be smuggled out — bound for use by jewelers, the automotive and aerospace industries, producers of medical devices and other manufacturers around the world. Trade and investment in natural mineral resources hold great potential for boosting growth and prosperity in the developing world. Too often though, misguided or illicit exploitation of these resources has contributed, directly or indirectly, to armed conflict, human rights violations, crime and corruption, and international terrorism, thereby impeding economic and social development. The story of “blood diamonds” is familiar to many — brought back into the spotlight recently by a controversial decision to allow diamond exports from Zimbabwe – but there are many other minerals that contribute to conflict across the continent. In 2010 the US Congress passed the Dodd-Frank Wall Street Reform and Consumer Protection Act, commonly referred to as the Dodd-Frank Act. This law has received a lot of attention because of its sweeping new regulation of the financial industry. Less known, however, is the fact that this same law (under Sec. 1502) imposes additional reporting requirements on publicly traded companies manufacturing products that could potentially be using “conflict minerals” (in particular tantalum, tin, tungsten and gold). The law obliges these companies to report to the Securities and Exchange Commission disclosing their tax, royalty and other payments on each project they operate. This provision will cover US and European companies as well as many from emerging markets that sell shares on US stock exchanges. Until last month, companies did not have a set of government-backed recommendations on how to undertake supply-chain due diligence. The new OECD guidance clarifies how all involved — from local exporters and mineral processors to the manufacturing and brand-name companies that use these minerals in their products — can identify and better manage risks throughout the supply chain. The guidance is also designed to foster private sector engagement in sustainable sourcing practices that nurture revenue-generating trade in clean minerals, creating a peace dividend while supporting broader development goals. The guidance seeks to avoid what all involved would consider an unhappy outcome: boycotting of mining in countries like the Democratic Republic of Congo (DRC). By incorporating the flexibility to allow trade to continue, it promotes responsible sourcing, bearing in mind that supply chains cannot become 100% conflict-free overnight. In this way, it avoids massive pull-outs that would have severe consequences for the poor populations that depend on mining for their bread and butter. Responsible solutions are possible. For instance, “bag and tag” programs — a scheme to track the origin of tin and developed to implement to the OECD guidance — are now being used in the DRC and Rwanda by companies extracting and trading in minerals. In a wide show of support, many have called on the Securities and Exchange Commission to refer to this guidance as providing reliable due diligence measures to meet the reporting obligations under section 1502. Such a reference to internationally agreed standards in the implementing rules being written now and anticipated to be issued in the coming months would ensure that companies will have one clear set of due diligence expectations throughout the entire supply chain, thereby avoiding multiple and potentially conflicting requirements for companies on how due diligence should be implemented. Section 1502 of the Dodd-Frank Act and a whole-of-government approach to the implementation of the new guidance offered by the OECD are excellent examples of how we can deliver on a “new paradigm for development” — one that looks beyond aid. In her speech last month in Paris, Secretary Clinton emphasized that we need a “new approach to development that will better prepare developing countries to move from aid to sustainable and inclusive growth.” This work moves us solidly in that direction. Rachel Flynn is a PhD student inLSE’s Department of International Development. Her thesis is Southern Sudan’s periphery: state-building in fragile border regions. The world is currently focussed on the unrest at Southern Sudan’s border with its northern cousin, but Flynn argues that it is just one of several border issues the new state will have to tackle. The killing of nine Kenyans by a group of Southern Sudanese in a remote region of the Southern Sudan-Kenya border on 15 June serves as a potent reminder of the extremely volatile and potentially explosive nature of the nascent country’s international borders. Given the history of Southern Sudan and the often nomadic nature of many of the groups living on its periphery, its international borders have tended to be weakly defined. It is this lack of clear demarcation, coupled with the neglect regularly experienced by border-dwellers, that has the potential to destabilise Southern Sudan. The conflict that resulted in the recent deaths of nine Kenyans has been playing out over a long period of time between the Toposa of Southern Sudan and the Turkana of Kenya. The crux of the issue is that because nomadic pastoralism is their main livelihood and they live in regions increasingly prone to drought, these groups need to share dry season pasture and water points. Historically, conflict over this resource-sharing was managed and resolved locally, but state intervention has led to an escalation of the conflict, creating a ‘damned if you do, damned if you don’t’ scenario for the Government of Southern Sudan (GoSS). This is not the only border region that is proving recalcitrant. 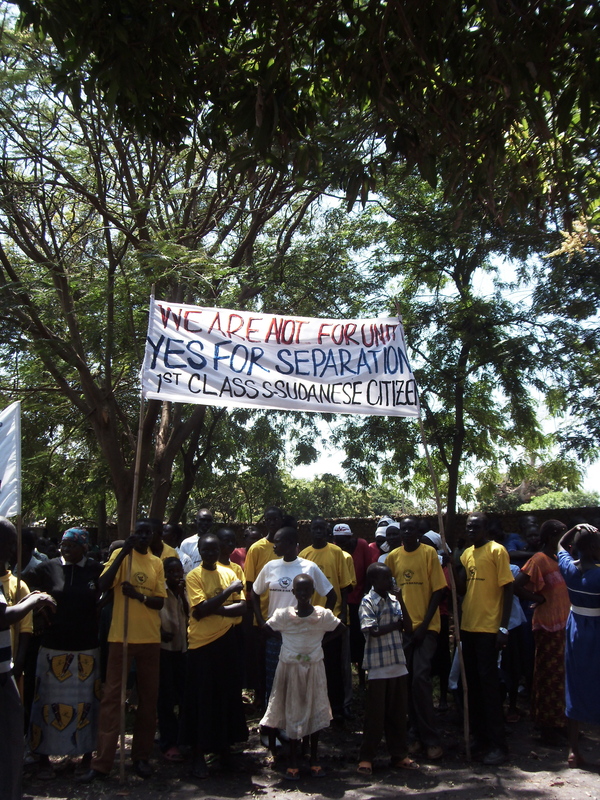 Recently in Nimule, a vibrant town bordering northern Uganda, the government’s attempts to stop locals using Ugandan Shillings instead of Sudanese Pounds led to such ferocious opposition, including the complete closure of the town’s market for a fortnight, that ultimately the government had to acquiesce. The use of Ugandan Shillings is only one symptom of this peripheral region being more integrated into the Ugandan economic society than the Southern Sudanese one. This failure of GoSS to exert control over its currency is symptomatic of the state’s weak presence and authority at its international borders. There are countless other examples of state weakness – the continued presence of the Ugandan militia group, the Lord’s Resistance Army, on the Central African Republic border; ongoing child abductions in Jonglei State bordering Ethiopia; and increasingly violent and fatal cross-border cattle-raiding on the Kenyan and Ugandan borders, to name just a few. At the moment, all eyes are on the north/south border as tensions mount ahead of Southern Sudanese independence on the 9 July. However, it is not the only border that poses major challenges to the Government of Southern Sudan as the country embarks on its nation-building project. Furthermore, it is not the only border region that deserves attention, a point that GoSS, the international community and the aid industry would do well to remember. An editor I once worked for had a golden rule for his reporters and editors: We don’t do process. By that he meant that news stories should focus on what had happened, not the tedious ins and outs of how it had happened. Not bad advice it you want to write a vivid story, and many journalists would probably subscribe to it. Indeed, it may help to explain why there’s such a gap in public awareness regarding two of the landmark development declarations of the 2000s. The first, the Millennium Development Goals, is known worldwide. Under eight main headings, it sets down a series of anti-poverty goals to be attained by the year 2015, including a memorable pledge to cut by half the number of people living on less than a dollar a day. The second declaration is less well known, in part, perhaps, because it’s all process. While the Millennium Development Goals are about what development should seek to achieve, the Paris Declaration on Aid Effectiveness is about the processes developing and developed countries should follow to achieve those goals. The language of the declaration and its five core principles can be a little obscure, but the message basically boils down to this: Development won’t happen sustainably unless developing countries themselves – and not donors – take the lead in setting priorities and coordinating activities. Since it was adopted in 2005, the Paris Declaration has been widely credited with helping to reshape relations between donor and developing countries – development expert Homi Kharas describes the process that created the declaration as a “watershed”. But whether enough has really changed is a matter for debate: It’s probably fair to say that developing countries still feel their donor partners could do more. How much more? That question, and many others, will be keenly debated at a major conference on development and aid effectiveness in November in the Korean city of Busan. The issues on the table are previewed in an article by OECD colleague Stephen Groff in the latest issue of Global Asia. As Steve points out, this forum – the latest in a series over the past decade – “will be the first international meeting of its kind to focus on aid in the new development landscape”. That landscape is, indeed, new: Traditional donors in North America and Europe are facing squeezed budgets and rising pressure to get value for money for their aid budgets. Newer donors, like China, India and Brazil, are becoming ever more important players in development. And there’s the evolving political and social situation, in which, as the Arab Spring has shown, things can change in a heartbeat. With well over a million hits in its first month, the OECD’s Your Better Life Index has proven to be very popular since it was launched at the 50th anniversary OECD Forum on 24 May.